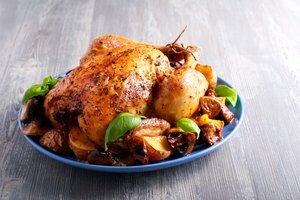 Roasting chicken can be time consuming, especially with larger birds, and it can be hard to get the birds to cook evenly. 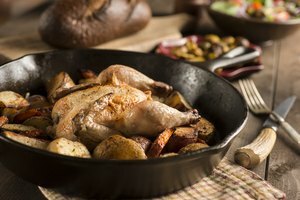 Convection ovens, which feature interior fans, circulate hot air better than standard ovens do, thus reducing the amount of time you need to cook a whole chicken. The bird also roasts more evenly in a convection oven. 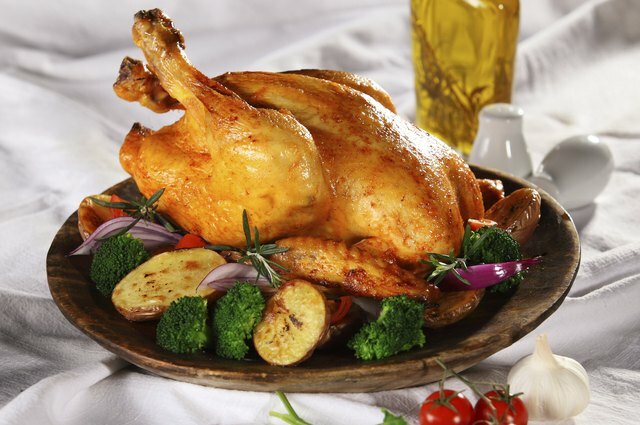 Season and serve a convection oven roasted chicken as you would any other whole, roasted bird. A convection oven is like a standard oven, only it has a fan near the heating element that distributes hot air evenly throughout the oven. Thanks to the fan, convection ovens don’t suffer from “cool spots” -- areas of slightly lower temperature -- that standard ovens have. Also, the temperature in convection ovens doesn't drop significantly when the door is opened. These features help convection ovens cook food faster and more evenly. 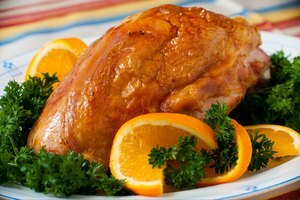 Whole chickens, especially larger chickens, can take several hours to cook, and a convection oven can significantly reduce the cooking time needed. In general, convection ovens reduce cooking times by as much as 20 to 30 percent if the cooking temperature remains the same. Because of the constantly circulating hot air, the chicken will come out with crisp, evenly browned skin, much like with a rotisserie. 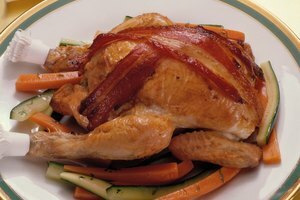 Convection ovens can cook marinated, dry rubbed or plain whole chickens, with or without vegetables in the same pan. For a basic convection roasted chicken, similar to a bistro style chicken, season the chicken by rubbing the whole bird -- inside and out, as well as underneath the breast skin -- with a generous amount of sea salt, cracked black pepper and either duck fat, olive oil or softened butter. For something more advanced, add fresh or dried spices, such as rosemary or oregano, or sprinkle ground spices, such as paprika or garlic powder, onto the exterior of the chicken. 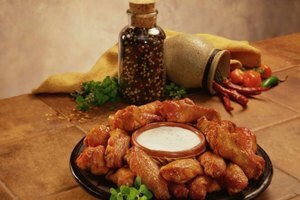 Let the chicken rest in the fridge for at least 20 minutes to allow the seasonings time to penetrate and adhere to the meat. Preheat the convection oven to 425 degrees Fahrenheit. The high temperature will ensure fast cooking and crisp, browned skin. Convection roast an unstuffed chicken at this temperature for 10 minutes per pound. 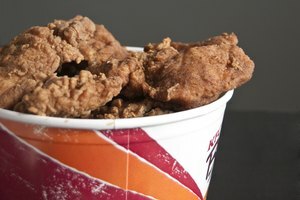 Begin testing for doneness after the first 30 minutes, and then every 5 minutes, to ensure that the chicken is not overcooked. When it's fully cooked, the leg of the chicken will be loose when wiggled, and juices will run clear. The meat will have turned opaque and white, although it may still be slightly pink near the bone. However, the most accurate test of doneness is a quick read thermometer to test the internal temperature. Measure the temperature at the thickest part of the thigh -- near the breast -- and do not let the tip of the thermometer touch bone. The chicken is ready when the internal temperature reads 160 F. Remove the pan from the oven and tent loosely with foil, letting the chicken rest for 5 to 10 minutes. The juices will redistribute through the meat and the chicken will continue cooking as it rests.